Pittsburg Beautiful committee members will host the Pittsburg Area Chamber Coffee this week at Pittsburg Farmers’ Market Pavilion. The community is invited to attend and help celebrate the completion of a new addition to Trail Head Park. The Chamber Coffee will be held 8:00 am – 9:00 am Thursday, October 5, with a grand opening ceremony immediately following. 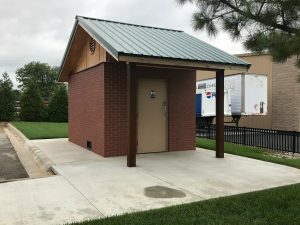 The project provided the addition of a public restroom to Trail Head Park, on the northwest corner of 11th and Broadway Streets in Pittsburg. Open all year long, the new facility offers pedestrians, cyclists, and downtown visitors a much-needed rest stop. Residents and tourists alike benefit from its close proximity to the mile-long Watco Trail, East-West connector trail and Pittsburg Farmers’ Market facility. The restroom will also benefit downtown visitors during crowded City parades and festivals. The addition was funded through Pittsburg Beautiful and built by Pittsburg State University Construction Management students, over the course of two semesters. City of Pittsburg staff assisted with ordering supplies, supervising the build and managing site finish work. 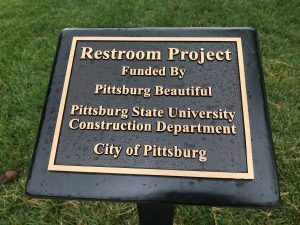 Pittsburg Beautiful is a coalition established to improve the image and appearance of Pittsburg through support for government action, coordination with other like-minded organizations, and by fostering individual responsibility for and appreciation of the beautification of Pittsburg. The volunteer group works closely with City of Pittsburg staff to improve the city’s appearance by planting flowers, bushes and other plants, cleaning up areas of the city, and rewarding Pittsburg businesses and residences that have improved in their buildings and landscaping.